[Location Factors] Timber, Paper & Pulp Industry: why developed in Northern Hemisphere High Latitudes? In most geography related books (or webpages), the industrial location topic is finished around a few paragraphs, citing a few clichéd examples of raw material, transport, market and labor. But given UPSC’s backbreaking moveTM, such content is neither exhaustive nor sufficient for the Mains level questions. Therefore, I’m compiling some wisdom scattered in other books/sources viz. I claim no expertise in geography, these articles are mere compilation of some wisdom and (a few) examples given in those books. Lot of minor places and countries have been ignored. I haven’t bothered to dig internet much for doing ‘full coverage’ or finding who is the largest producer as per latest data. It is your job to fill up the details as and where you feel necessary. And Try to dig examples from your own state- that way it helps even during UPSC interviews or State PSC exams. Wheat, rice, tea, groundnut etc. in India. Because they need to be prepared for agro topic under paper 3. Mica, manganese and variety of minerals because they need to be prepared for “Distribution of key natural resources across the world (including South Asia and the Indian sub-continent)” for paper 1. Elaborate coverage not done on Energy, Ports, Roads, Airports, Railways etc. for India because of paper 3. In between ^them two: depending on transport, energy and labour convenience. Nature of raw material Bauxite=>alumina; Copper ore=>blister copper; Sugarcane=raw sugar. Weight loss is significant, during above processes. So, where should we setup these factories? energy Despite having no significant bauxite reserves, Canada and Norway have aluminum refineries, why? transport Why is Switzerland famous for wristwatches but not bulldozers?Why do port cities have lot of industries surrounding them?Inland water transport helped in the development of Great lakes-Pittsburg industrial area in US. Then on the same logic, why is Africa underdeveloped despite having so many rivers? labor Sierra Leone is famous for rough diamonds but not for jewelry, why?Largest assembly for iPhone is in China and not in US, why? market demand Australia is a major supplier of wool but not major supplier of finished woolen garments, why? Government policy Pharmaceutical industries that once had shifted from Gujarat/Maharashtra towards Hill states, are now returning back to the original states, why? Capital Even after local coal-iron resources are depleted, the steel and heavy engineering industry doesn’t frequently shift its location, why? Physical geography How does Canadian winter help in commercial exploitation of timber?Fishing industry more developed in Northern Hemisphere than in Southern Hemisphere, why?How can the dairy products of New Zealand compete in American / Europeans market despite additional transport cost? Other factors: entrepreneurship, availability of technology, location of competing firms etc. Each factor has different level of attractiveness for individual industry. They make complex products using the material obtained from primary industry. Light industries= electronics, plastic, textile, cosmetic etc. it is not a branch of manufacturing but it sells the product of primary and secondary industries via transport, wholesale, retailing + provides services such as:tourism, education, entertainment, advertisements, consultancy, Administration, healthcare etc.Note: for detailed classification of service sector industries, refer to Page 56 of NCERT Class 12: Fundamentals of Human geography. What are the geographical factors affecting location of this industry? When this wooden logs are processed in the sawmill, significant weight loss occurs. Barely 40% is used and rest discarded as waste. Therefore most pulp mill and saw-mills are located near the jungles to reduce the cost of transporting waste matter. Even in jungles, they’re located near rivers and streams because Logs=bulky and awkward to transport. Rivers provide cheap and convenient mode of transport. E.g. Myanmar, the teak logs are floated down the Irrawadi river upto Yangon and then exported. The paper/pulp mills require clean water free from chemical/pollutants. This is one the reason why they were setup in forest locations away from polluted rivers. Rivers flow in the opposite direction from market areas=higher transport cost. + in Russia, rivers remain frozen in winter and create flood like problems in springtime=makes difficult to exploit Siberian forest. In coniferous forest, trees of same species are concentrated in one particular area = mass exploitation easier compared to tropical areas. During winter, the Jungle surface is covered with snow= slippery surface= easier to move logs to rivers. The winter season in Canada is long = agricultural activities are limited. During winter, they migrate to northern (coniferous) forests along with their families => Easy availability of lumberjacks. Lumbering is highly mechanized with the help of chainsaws, bulldozers etc = low population-density doesn’t create much problem. These forests are close to economically developed regions, where demand for wood is higher e.g. USA for newsprint paper. This heterogeneous supply of timber= cost of gathering is high. frozen ground helps transporting logs from jungle/hills up to rivers. Valuable trees are scattered throughout jungle, you need some land transport before logs reach the rivers. But road construction is difficult due to rain, dense vegetation. Settlement is sparse, economies are non-industrialized, away from demand areas (e.g Africa). (Exception) Malaysian timber= finds ready-made market in Japan and Australia. replantion programs, silviculture, strict government regulation on lumbering= jungles regenerate = lumbering is continuous economic acivity. Canada is one of the largest newsprint producer of the world. 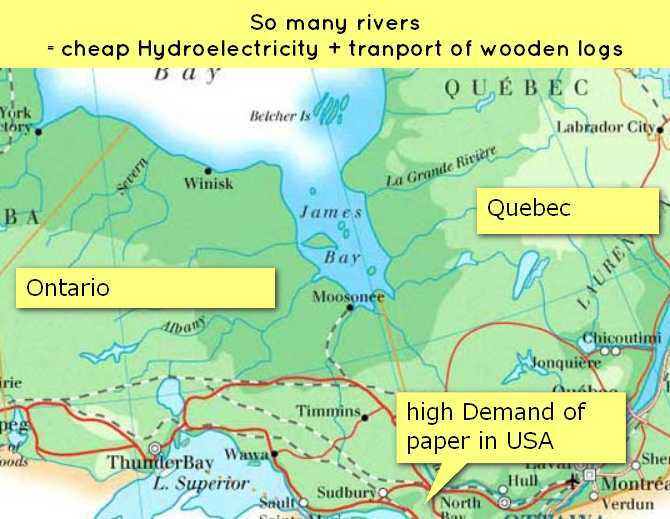 Its Québec and Ontario provinces= largest concentration of paper-pulp industries, Why? Raw material Forest area is large enough to supply timber on a constant basis. Transport Ideal location for mill= riverside. It minimizes transportation problems. 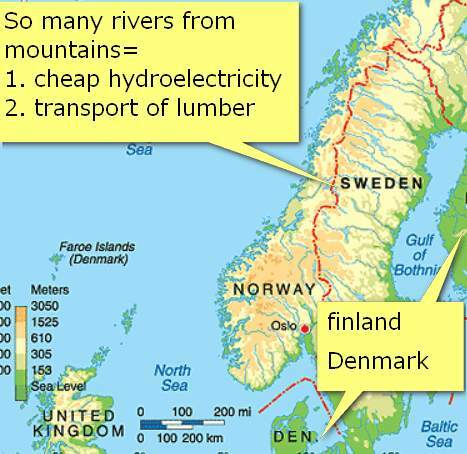 Canada has mountainous terrain + fast flowing rivers= Cheap hydroelectric Power available. USA has highest paper consumption in the world, provides a ready-made market for the paper pulp industry of Canada. Raw material Its timber output is negligible but still a major paper-producer thanks to pulp-imports from Sweden and Canada..
Mills located @coastal areas, to process imported material (=less transport cost) Example Mill near Thames estuary, Manchester Ship canal. (In later articles, we’ll see that Manchester canal was developed to turn Manchester into a port for textile business but then Manchester textile industry declined due to competition from Cheaper Asian garments.). Rivers flow towards ports=easy for transport. Best wood found inland, has to be transported through rivers towards coast. Kolkata: raw material brought from North Eastern States, cheap labor, coal, water available. Lucknow: Depend on bagasse (from sugarmills), rags, wheat bran. Sabai grass brought from Terrai region. In the next article, we’ll see the location factors affecting fishing industry Click me and then simutelnously mock question related to both industries. great article sir, if you can post a series for geography similar to that of world history… An all inclusive one it would be of great help…. You Are simply great Sir.. Hats off to you…….Now i am not gonna prepare world industry section.. i will fully rely on you sir.. This is more than sufficient + just need to see NCERT for maps…. Thanks Mrunal Ji……Great effort on your part…. thanks sir, for this awesome article. one more reason for why fishing occurs along west cost of India then east cost?? most of the Indian river flow towards east cost, so in bay of bengal water is muddy and it creates low photic zone (sun light penetration in sea water is low)= less plankton= less fish. on the contrary in Arabian sea the situation is totally reverse from bay of bengal. Another reason is the more indented nature of the west coast of India. This is also the reason for more harbours along the west coast. can you explain how does the indented nature of west coast is the reason for more harbors?? Another reason, oceanic water in western coast has higher Phosphate and nitrate content which results in higher plankton productivity. Thanks Mrunal, you have picked the right topic, hoping you will continue with topics which are a little unconventional. On a totally different note, what is the expected date for prelims result? I wonder, how Mrunal explain these matters without readers getting bored. Thats Mrunal style of teaching. It is not feasible for everyone to buy too many books. and even if one buys all the books…there is no time left to read all of them…hence getting a very well explained and compiled article on each such topic is really great. The most essential thing i learn from ur articles is the approach one must follow for mains preparation. Sir i am facing a serious problem related to mains preparation.Going by the paradigm shift in UPSC syllabus it is expected that dynamic/analytical approach in the GS section which is going to be decisive.I gathered photocopies of all coaching materials but i feel all are useless/outdated. I am reading The Hindu for last 3 months.I study from the RSS feeds for older editions.I realize some topics are important which can b asked.But they are not exhaustive.I request u to make a section in ur blog where the aspirants can pour in valuable information/articles/links so that we can mutually reduce the overhead of data collection/filtering. I also request u to release, say 25 questions per week(from GS syllabus of various subjects) so that we can gather sufficient information regarding those for mains preparation. YES ,this is a big problem with paper 3 and paper 4 . Sir,Is this topic include in GS-III? in food processing and related industries in INDIA -scope significance, location,upstreams and downstream requirments,supply chain management? fabulous …keep it up…. our pray will also help you…. I am regular follower of your blog and personally thank you for spreading this knowledge and understanding of yours not as a teacher but as a friend. You are showing a path to young blood surely some of them will be IAS in coming year’s. The most amazing part of yours is spreading knowledge free of cost in a world where coaching centers charging fees which is beyond the reach of normal man. can we get these books in hindi? plz tell me mrunal. Incredible ! Love your notes ! Keep going and stay blessed. as my knowledge,china is the largest producer and exporter of seafood and 35% of the world seafood export is from china.i dint find china in ur article anywhere.can u mention the details. Well Mrunal is showing a very visible continental shelf around the China’s sea shore and you are saying you are unable to find China in the whole article !!! PL confirm Whether continental shelf in east coast is wider or west. Its east cost which is wider that was the reason of the reason for having more port in west coast. In wikipedia, its mentioned that china ranks 1st in paper n pulp industry and US 2nd… canada ranks 5th. Even germany and japan are above ranked than canada. But acc to your article, canada seems to no 1, with USA importing all her newsprint paper, n china, japan germany dot produce significant amt.. plz explain this paradox…. China took over USA only after 2009. Three reasons – 1. China sponsored biotech research. Eucalyptus plants are cloned in laboratory with quality to grow freakishly, 10 times faster than a treecompletely grows in naatural conditions. Samplings are 1st grown in controlled-temperate-climate-labs and then planted. 2. China govt subsidised paper industry between 2003-2009 which helped to grow. 3. During same huge industry came into existence in China Hunan provice. They started importing wood and pulp even from Wisconsin state! Also china developed big paper recycling industry annually importing billions of tonnes of paper waste. Before 2009 USA was largest producer, industry concentrated in Wisconson state. By what mechanism nutrients ,from the sea bed , come to the surface of the sea where hot and cold water currents mix ?